On Saturday morning the alarm went off at 8am. I had a renewed respect for people with kids. Getting out the door by 9am on a Saturday isn't a regular occurrence in our household. 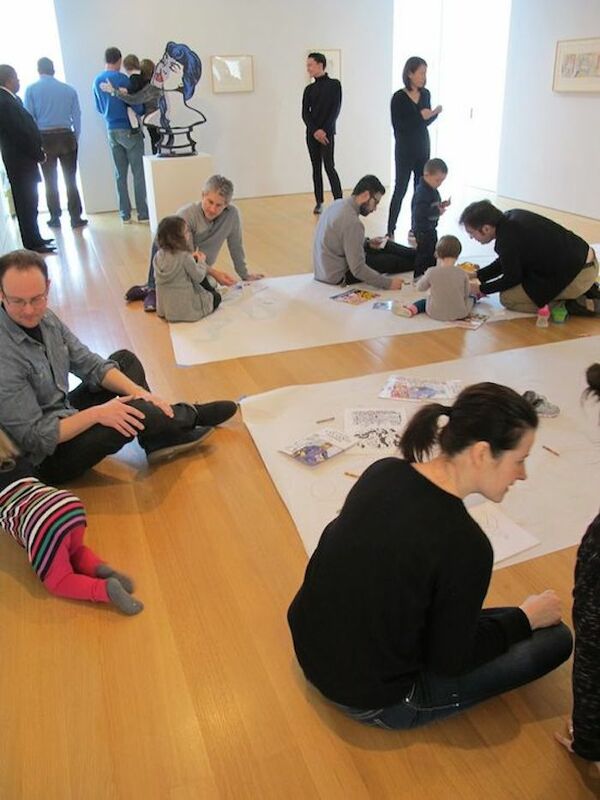 But, on March 1, fortified by coffee, I headed into Chelsea for the FLAG Art Foundation's Baby Art History Program coloring party. 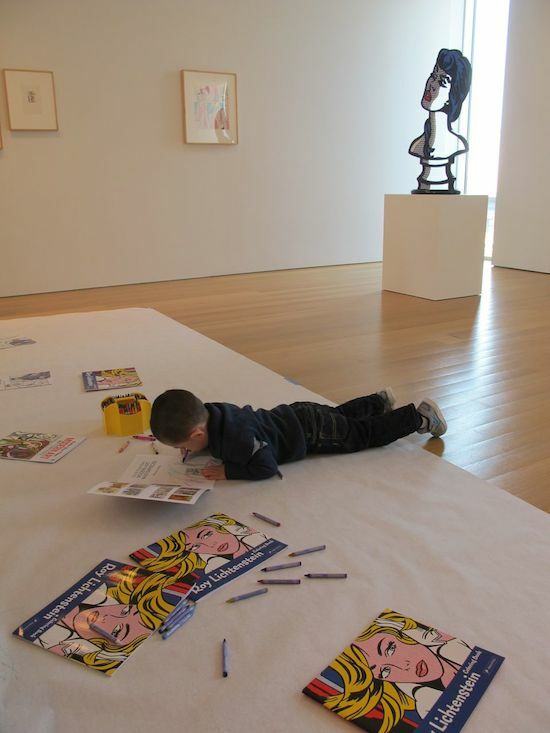 The coloring party was another in a series of educational events hosted by the FLAG Art Foundation as part of its Baby Art History Program -- the brainchild (pun intended) of founder Glenn Fuhrman, an avid art collector, philanthropist and father of a toddler. Past events have included studio visits, talks by artists and goodie bags with a Jeff Koons-inspired toy inside. The coloring party scene at the FLAG was as vibrant as any opening reception, despite the early hour. As they settled in, enthusiastic toddlers colored with crayons on large swaths of white paper covering the gallery floors with a show of Roy Lichtenstein's nudes and interiors as their backdrop while their parents looked on -- in some cases, coloring along with their children and chatting with the other adults. Fuhrman hosted the party with his wife Amanda and their daughter. Always a good-natured host, he offered up crayons and cheer, in his kid-friendly sweater with an image by Keith Haring of what looked like an alligator DJ'ing. When asked what was his most surprising discovery as host of the Program Glenn noted, "Nothing too surprising so far, but it's been a great time seeing these kids enjoying the art and each other. I have hopeful visions of some sub-set of these kids going to galleries, museums and artist's studios together for the next decade or two." Many of the people I met at the party were there because it gave them an opportunity to enjoy art in a kid-friendly space. Ira Sachs, a filmmaker, was there with his husband and their twins. He noted that it was a great opportunity to expose their children to gallery culture at an early age -- something that can be intimidating, even for adults. The FLAG's Baby Art Program is open to the public, but what if you're not near the heart of Chelsea and are looking for something similar? Many museums have early education programs you can check out or you can make your own class out of a solo trip. Even if museums or galleries aren't your thing, Rebecca Streiman, assistant director of FLAG, made a great point -- art is all around -- from your local cafe to a billboard to the way the sunlight hits a nearby building or body of water. Kids are great at reminding us of that. People want community and art is a good way to build it. Says Streiman, "Send out an email and you'll be surprised by how many responses you get." By 11, the drawing party was coming to a close. I joined the strollers and scooters in the elevator and headed out into the morning. A few intrepid families seized the opportunity to wander into nearby galleries. Thanks to the early start, I was able to enjoy a baby art party and do a Chelsea gallery hop -- all before lunchtime.